It is not uncommon to have a little, or even a lot, of anxiety about an upcoming dental appointment. Whichever end of the spectrum you might be on, you are not alone. It’s possible, even for those of us who are the most afraid, to reduce that fear and to learn to have dental work done in a way that feels calm and safe. At Alrez Family Dentistry we are committed to helping you have a comfortable, pleasant dental experience . If you are nervous or anxious about your dental treatment you may benefit from conscious sedation. 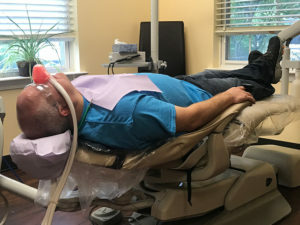 At our Glen Mills dental office, we offer affordable nitrous oxide which is also commonly known as “laughing gas”. Dr. Alrez carries a special certification required in the state of PA to allow her to provide this service to her patients. It is a slightly sweet smelling, non-irritating, colorless gas. The gas is inhaled through the nose and the amount needed to make you feel comfortable is tailored to meet your needs. No one is allergic to nitrous oxide and it can be used safely and effectively for most patients. Nitrous oxide is one of the most valuable sedative techniques available for use in children. The range of procedures in which the use of nitrous oxide is appropriate in our dental office is limitless. Whether you’re having a teeth cleaning, getting fillings, crowns, a root canal, surgical procedures or even to help alleviate a gag reflex, Dr. Alrez and our team are dedicated to ensuring that your dental experience is relaxed and that you are at ease throughout your visit. And since the sedation effects of nitrous oxide are almost immediately reversible on completion of your procedure (within 3-5 minutes! ), our patients may leave our dental office unescorted and are allowed to resume their normal activities for the remainder of the day. Contact our office if you have any questions about nitrous oxide or its use!